BRECHIN CITY V PETERHEAD '(DUNCAN BROWN)' 'PETERHEAD'S KEVIN DZIERZAWSKI CLEARS FROM LEWIS SPENCE. 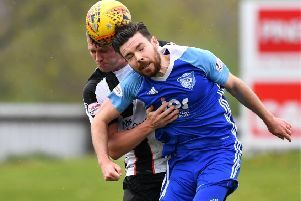 Peterhead’s worrying form going in to the play-off’s continued with a thrashing by strugglers Brechin where it was difficult to tell throughout the ninety minutes which team was going for promotion and who looked relegation certainties not that long ago. City, as like Cowdenbeath and Forfar before them, were fired up and fought for every ball. The Blue Toon, depleted by injury, by contrast looked disjointed and dispirited and a massive pick up job is required if a team fit to beat Ayr United is to be fielded never mind who they will meet from the Championship should they overcome their Ayrshire rivals. BRECHIN CITY V PETERHEAD '(DUNCAN BROWN)'' PETERHEAD'S NATHAN BLOCKLEY SCORES THE BLUE TOON'S ONLY GOAL. You have to feel sorry for Manager Jim McInally who has lost virtually his entire defence and with some of those key players possibly out long term, a makeshift or not fully fit rearguard looks set to battle it out for promotion. Missing the injured Ryan Strachan, Simon Ferry and Ally Gilchrist with Rory McAllister a non playing sub on the bench, the nightmare continued after 17 minutes with Scott Ross limping off to be replaced by Marc Lawrence. By that stage the visitors were already a goal down and soon after the deficit was to double. Andy Jackson lashed in the first after just five minutes and when their lead was doubled in the 21st minute by Robert Thomson, it already looked like this was going to be a long afternoon. A glimmer of hope came on the half hour when what looked like a lifeline, full back Nathan Blockley of all people finding himself in the centre-forward position and picking his spot with a well placed shot into the bottom right corner. BRECHIN CITY V PETERHEAD (DUNCAN BROWN) ''PETERHEAD'S MARC LAWRENCE TACKLES LIAM WATT. That joy wasn’t to last until half time when a quick fire double effectively ended the game as a contest with first Liam Watt then Thomson with his brace in the final three minutes of the half. The second half began in more encouraging fashion for the Blue Toon with their Manager’s words still ringing in their ears and a Shane Sutherland shot from distance kept the Brechin Graeme Smith on his toes. Unfortunately he could have brought out a paper and read it whilst leaning against the post for the rest of the match as all of the action took place at the other end. Jackson could have assisted in the fifth goal when his cross from the byeline saw the other Graeme Smith attempt to grab then fumble the ball with it appearing to cross the line before he recovered to scoop it clear but the officials took pity. The pain was only delayed though and Thomson grabbed his hatrick with 20 minutes left coolly slipping the ball past the advancing Smith. Fortunately the home side took the foot of the gas but there was little sign of further consolation goals and the sight of 11 dejected men in blue trooping of the pitch will not have raised the spirits of the travelling fans. Peterhead – Smith, Blockley, Noble, Dzierzawski, Ross (Lawrence 17), Brown, Stevenson, Redman, McIntosh (Ferries 73), Sutherland, Riley (Rodgers 53) Unused – Jarvie, McAllister.